You can't have missed the parade of pink wheelbarrows dotted around Goring & Streatley - the shops, the cafes, the pubs, the dentist and even the Golf Club. Local businesses have filled their wheelbarrows with a delightful mix of plants, paraphernalia and a plethora of other delights. One of them has a giant highlighter pen (and it works - how cool is that!) and one even has a bottle of champagne! AND, these lovely pink wheelbarrows now need new homes. Would you like one? YES? Then come and make a bid. The wheel barrows are being auctioned on Festival Sunday in the Gardiner Recreation Field, next the marquee. You can inspect the wheelbarrows and make your bid during the morning. The grand auction will take place at 3pm. 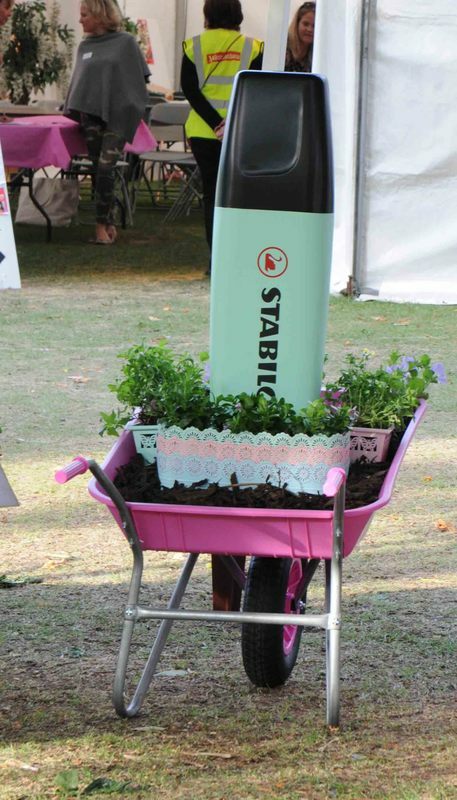 Now you can make your garden pretty in PINK! 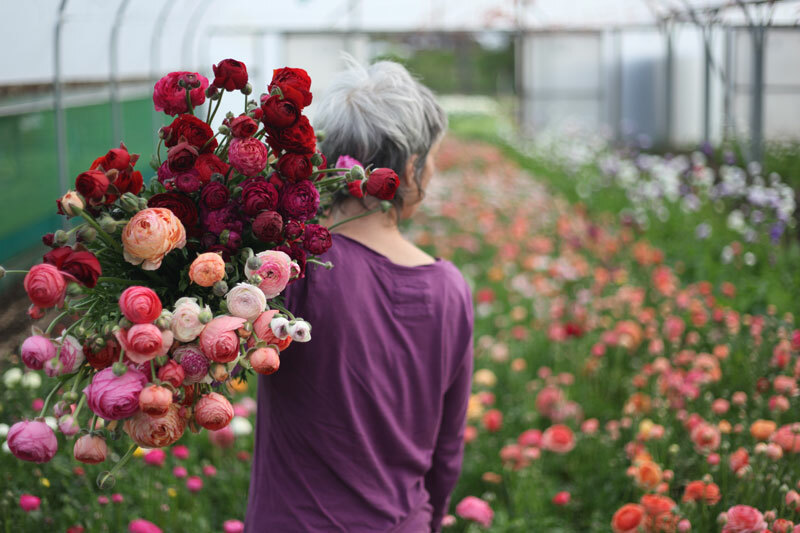 Rachel is a pioneer in sustainable, seasonal floristry and is known as the ‘flower grower’s flower grower’. She regularly features in titles such as Homes & Gardens, Country Living and Gardens Illustrated. She has been recognised by British Flowers Week as one of ‘the twenty most creative florists’. Not only will Rachel present a Hand Tied Bouquet Master Class, you’ll even be able to take a little bit of Green & Gorgeous home with you as she’ll be selling some of her amazing blooms. So what really happens behind the scenes at the RHS Chelsea Flower Show and Gardeners’ World and what does it take to win a Chelsea Show Gold Medal? Joe Swift the cheerful award-winning garden designer, journalist and TV presenter will take to the floor and reveal all in a fascinating, humorous and anecdote filled presentation that promises to be a sellout. His talk, Designing a Gold Medal Chelsea Garden, won’t be limited to inspiring gardening tales, you’ll discover the other side of Joe Swift…. There’s more to this man than a national controversy over raised beds. Joe will end his session with a Q&A section. Don’t miss it! This is your opportunity to test the knowledge of our unique panel of experts who promise to answer your wonderful questions and identify your weird plants! Then we round off with Open Gardens on Festival Sunday. After all this top advice and inspiration we’ll look forward to some magnificent Gap gardens in 2019! Opera ... A dance with a big band ... A queen of crime fiction discussing her work. Gardening will feature because gardening is an art and a celebrity garden designer will give us insight into designing a stunning garden. There’ll be an Art Trail with local artists opening their studios and a visual arts exhibition to include textile art for the first time. Of course there will be music including a very special woodwind concert for children and babies. Poetry and drama will also feature we're planning a fabulous Family Day for Festival Sunday. ​There will be much, much more going on around the villages from 9th June onward so look out for details of workshops and children's events – more ideas are being investigated and more events will be generated as we approach the Festival, so watch this space! It's official! The 2018 Gap Festival will take place from 14 – 17 June. Save the dates, 4 amazing days are in store. We have a new Artistic Director, Heather Dunthorne who is already deep in planning for 2018.
for her inspiration, hard work and dedication over the last four years. I aim to build on the success of the past two Festivals and, with help from the rest of the team, ensure that 2018 will be another wonderful time full of entertainment and celebration. Work on the 2018 Festival programme is underway and I can tell you that there will be something for everyone of all ages - great music, inspirational speakers, comedy, new things to try out in a range of workshops, family fun and some unexpected sights around the village. I hope you will find yourself spoilt for choice! You’ll already have seen the first of our Festival ExtrA! events, an evening with Simon Evans. We’re planning more of these during the year so you don’t have to wait until 2018 to get into the Festival spirit! As you may know, the Festival is run entirely by volunteers – from the governing board to those who help on the day. Without these generous, community-spirited people the Festival wouldn’t be possible. If you can help in any way, please get in touch. We need people right now to help us in the planning stages. Have a look at our Volunteers Page and get in touch if you’d like to get involved!